The new Version 3 of the Spot Welder is a complete redesign of the pcb layout and also the Arduino Code. But the new V3 mosfet board is still compatible with the older V2.2 Arduino boards. Standby feature: after 5 minutes of inactivity the Spot Welder will go to standby and the foot switch and AutoPulse will be deactivated while in standby. If you wonder why the prebuilt kit is more expensive now, it is because of the new more expensive components (mainly OLED display, mosfets and diodes). But you dont need to get extra TVS and Schottky diodes any more and also no external power supply, so in the end it costs basically the same as before. 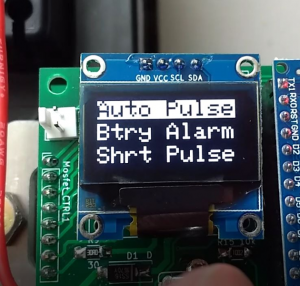 The main screen shows the Pulse Time (adjustable by turning the rotary encoder), the battery voltage, the total welds done and if the AutoPulse feature is activated. You can enter the menu by “clicking” / “pushing on” the rotary encoder. Auto Pulse: Here you can turn the AutoPulse on or off and set the delay time. The “AutoPulse” feature automatically activates a pulse after a 2 second delay (default) when both welding tips touch the nickel strip. If it is activated you can not use the foot switch to activate a pulse. The main screen will show “AUTO” in the right bottom corner if it is activated and “MANU” if it is deactivated. 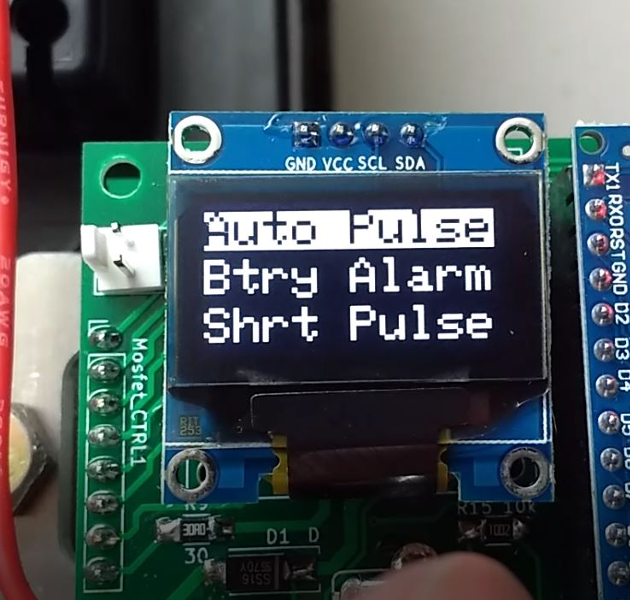 Shrt Pulse: you can set the duration of the short pulse in % (1 …100) . For example if it is set to 10% and the main pulse is set to 20ms the sort pulse will be 2ms. The short pulse will always be at least 1ms no matter what % value is set. So if the main pulse is 5ms and short pulse is set to 10% it will still be 1ms and not 0.5ms. Wow, the new version looks great! Do the aluminum parts you are selling for v2 still work for v3? Also, you recommend 3S batteries for using LiPo. Wouldn’t a 4S be closer voltage to a fully charged lead acid battery? The aluminum parts do fit on V2 and V3 PCBs. 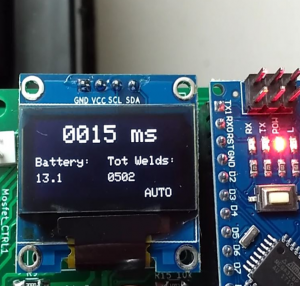 The Spot Welder is designed to be used with a 3s Lipo battery or 12V car battery. A fully charged car battery typically has a maximum voltage of about 14.4V. This voltage pretty fast drops down to 13.8 … 13.5 V after removing the charger. A 4s Lipo would be 16.8V fully charged, which is a bit to much. The TVS Diode on the mosfet board will slowly start conducting at voltages over 14V. This is designed like this so it fully conducts at voltages between 20 and 30V. This way the diode limits the voltage spike at the pulse ends to about 30V maximum to keep the mosfets in a safe operating area. This design is awesome! I could not find any part numbers or info on the OLED display. It appears the BOM is no longer on Github. In the BOM is a link where you can buy the OLED display. Kann Ich mit der neu Spot Welder V3 auch an eine Auto Batterie Ladegerät benutzen. Nein, das Ladegerät kann nicht genug Strom liefern zum schweißen. No, the charger is not capable of delivering enough current for welding.